The Fellowship was fortunate enough to obtain a copy of SWITCH #1 from Image Comics (and Top Cow). Stjepan Sejic writes, draws and colors. 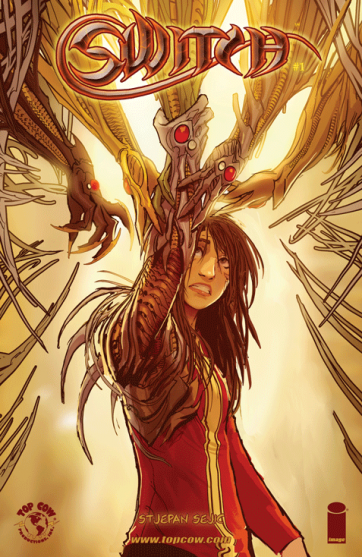 The Witchblade has been dormant, without a bearer, for a while now. The war has been quiet, but now it’s starting to hear the call. A new bearer is ready, and it is… Mary. Mary has no idea what’s going on, or what the Witchblade is, really. But it appears to have chosen her at a very opportune time, allowing her to save her brother. The real fight, though, has only just begun. Mary is a pretty normal teenager, which makes for a relatable lead character. It also makes her a bit of a departure from the Bearers of the past, as we get a glimpse of in this issue (but no spoilers). We also get a brief look at the “other side”, which hints to us about the war that’s coming. It’s a fun story all around, and the art is up to the usual Sejic standard, which is “amazing.” I love how expressive and detailed it gets here. This is a very cool new beginning for this fantasy powerhouse. And I can’t wait to learn more about the inner workings of the ‘blade. SWITCH #1 is available now at your FLCS or at imagecomics.com.